Senior BJP leader L K Advani said his party would prefer to sit in the Opposition if it failed to secure an absolute majority in the Uttar Pradesh assembly election. If the BJP was voted to power in the state, it would provide a people-friendly government like in Gujarat and MP, he told an election rally here. Attacking the Congress-led UPA government at the Centre on the corruption issue, Advani said never before any Union minister had been sacked after the court verdict. Listing achievements of the NDA-led government at the Centre, he appealed to the electorate to vote for the BJP for good governance in UP. Addressing a rally in Pallia, BJP veteran Rajnath Singh reminded the people about the achievements of the BJP-led governments in UP. He said the development work in UP would be set on right track if the party was voted to power. 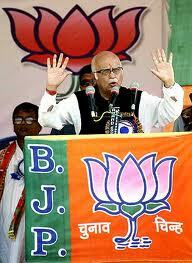 Singh said the BJP was the only party which could provide corruption-free and people-friendly governance in UP.